Almost every Tokyo itinerary will include an attraction here but there's more to this eastern ward than meets the eye. Known for its old downtown shitamachi areas such as Asakusa, Ueno and Yanaka, Taito City is a must for any Tokyo explorer’s itinerary. It’s the capital’s smallest “ward” (the municipal division of neighborhoods across Tokyo) but one of its richest in terms of history and traditional culture. 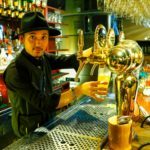 You’ll find it in the East, two steps beyond the electronic mania of Akihabara and the prestigious University of Tokyo, and bordered on the right side by the Sumida River. Whether it’s to witness the gigantic red lantern of Thunder Gate at the iconic Sensoji Temple or Instagram pictures of sleepy cats along the anime-famous streets of Yanaka — almost every Tokyo itinerary will include a stop in Taito City. But it’s always worth staying a while within the ward’s borders to explore further and get a real glimpse into Tokyo’s most authentic pocket. 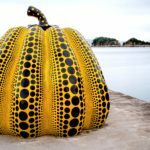 This list of things to do in Taito City includes well-known attractions as well as some of the more secret spots. For more places to explore, head on over to the Authentic Tokyo online travel guide. 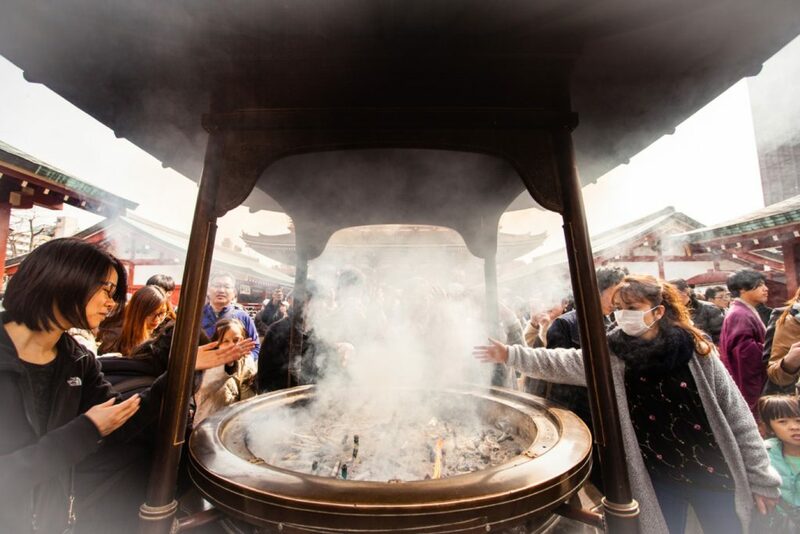 Visitors at Senso-ji wafting incense over themselves for good health. Sensoji is dedicated to Bodhisattva Kannon: the goddess of compassion and mercy. With over 30 million visitors every year, this stunning place of worship is one of Tokyo’s most famous cultural sites. 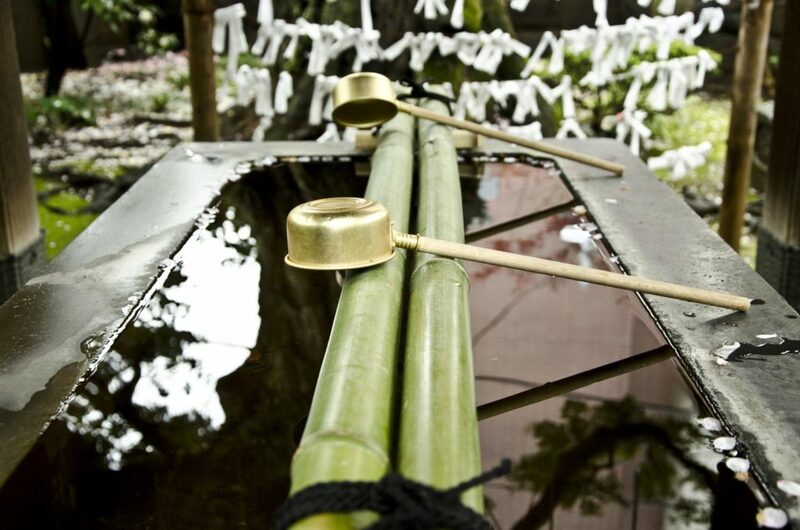 Before you enter the temple, you can participate in the ritual of incense bathing. By fanning the incense smoke over your face and body, it is believed that you can ward off illness and obtain healing. After, grab an omikuji (paper fortune). If you get a good fortune, keep it! If you’re given a bad one, tie the paper to the strings beside the temple so the bad luck will stay behind. In the distance, you can just make out the roof of Senso-ji’s main hall at the end of Nakamise-dori. 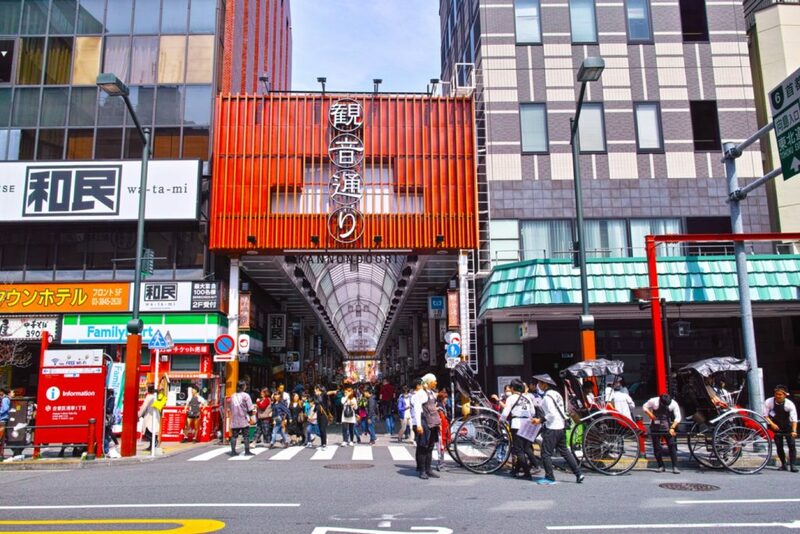 Also referred to as Nakamise-dori, this shopping street is located right beside Sensoji Temple. Nakamise Street is one of Japan’s oldest shopping strips, its history dating all the way back to the 17th century and Edo period Japan. Here, vendors sell a wide range of traditional goods and foods, such as umbrellas, fans, ningyo-yaki (small cakes filled with red bean paste), senbei (rice crackers), and matsuri (festival) wear. Rickshaw drivers can be found scouting for customers along the street leading to Senso-ji. Explore authentic Tokyo in traditional yet surprisingly speedy style by organizing a jinrikisha (rickshaw) ride. Drivers in traditional dress will run and pull the rickshaw (yes, with you in it) behind them around the main attractions and through hidden local spots of Asakusa, explaining the history along the way. You can find them lining the street from in front of Kaminarimon Gate at Sensoji Temple. Exploring Taito City in a yukata is a real only-in-Japan experience. Renting a kimono or yukata (a lighter kimono, worn in the summer) is a fantastic way to gain a deeper cultural experience while exploring Taito City. 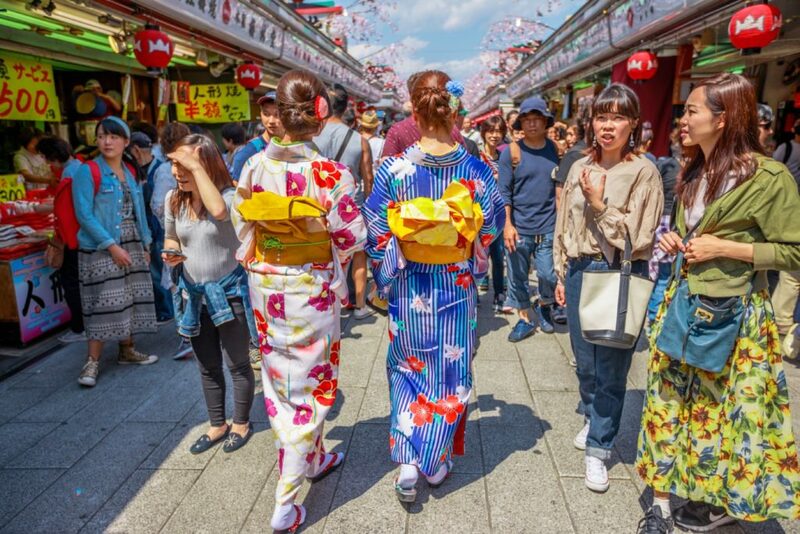 Tourists often don kimono or yukata for fun while exploring temples, shrines and shopping streets. Particularly around Sensoji Temple, there are a wide range of kimono rental shops where staff will style you in traditional dress — some offer professional photography as well. 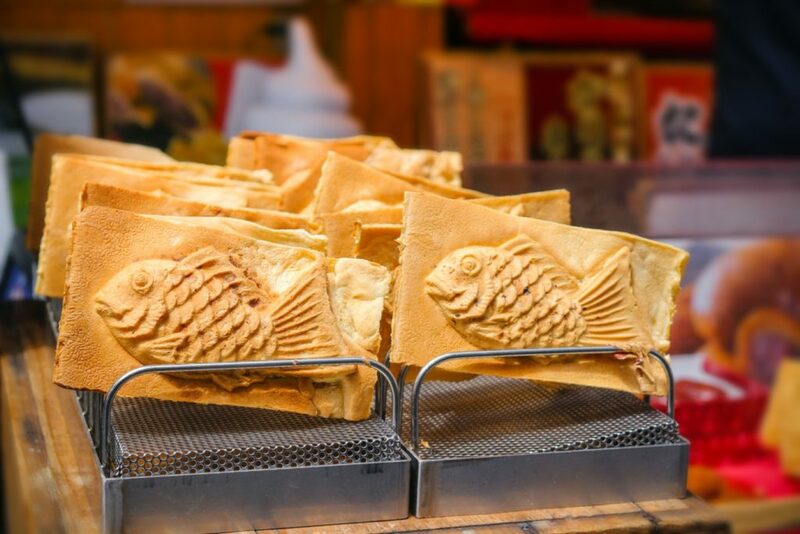 Taiyaki is a fish-shaped cake fill with sweet red bean paste (anko in Japanese). And beans = healthy, right? Taito City is home to an interesting range of Japanese cafes, many of which are located in authentic Japanese-style buildings. Try some wagashi (traditional sweets) while enjoying the unique architecture of these beautiful old houses and shops. Kakigori (shaved ice), daifuku (sweet rice cakes), taiyaki (fish-shaped pastries) and matcha ice cream are among the most popular to try. Don’t miss Suzukien Nanaya in Asakusa, home to the “world’s strongest matcha gelato” — it’s got so much matcha in it, it makes your tongue go green. Manekineko attract good luck by waving their paw. 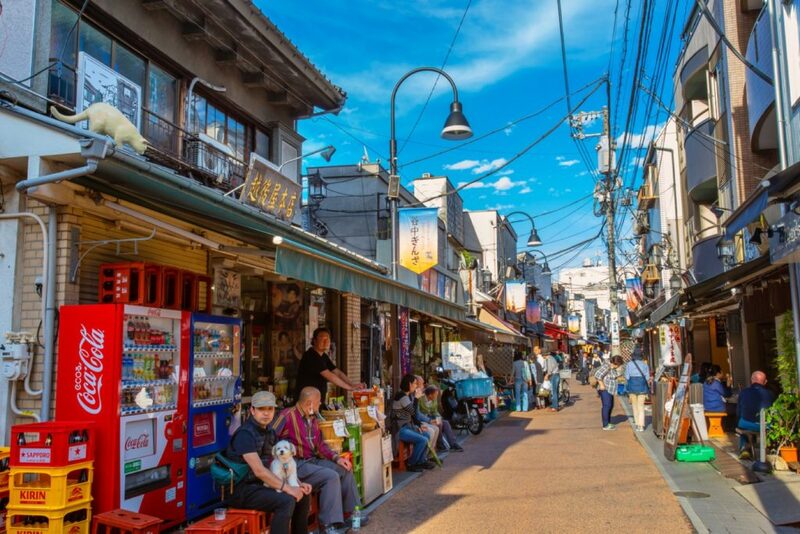 The picturesque pre-war neighborhood of Yanaka is home to many cats; from fluffy friends sitting beside shop windows, to feline-themed food, to specialty shops selling lucky cats. 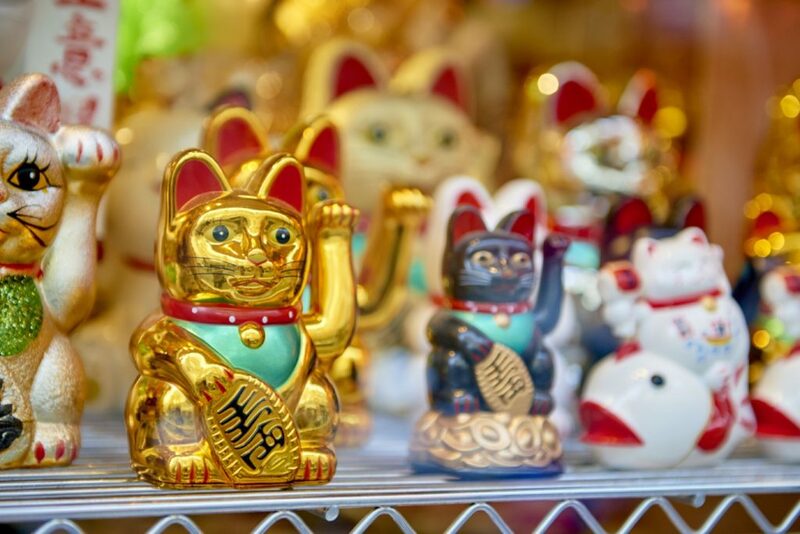 Pick up a manekineko (lucky cat statue) said to bring their owners good luck by beckining with their paw — choose one for finding love, making money, attracting new customers, or whatever you’d like to bring into your life. After you can browse the cute mishmash of traditional shops and cafes dotted around the narrow streets (see no. 20 below). 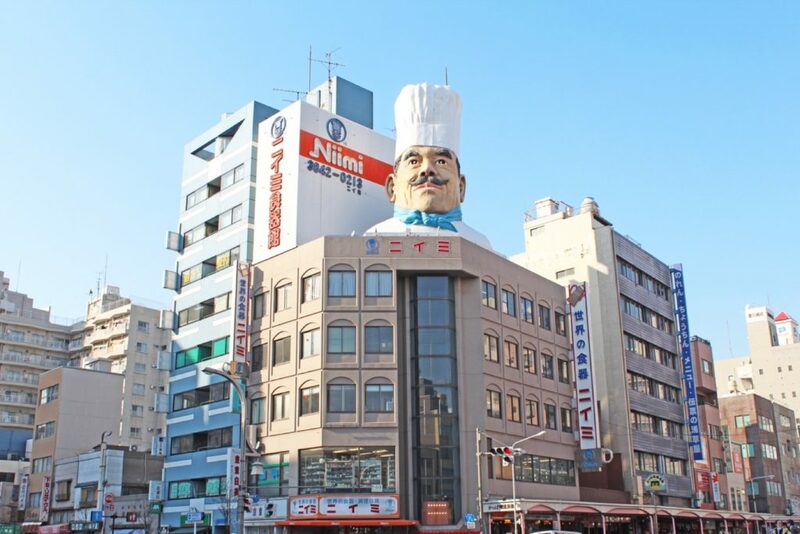 The giant chef’s head is sadly not for sale. Kappabashi-dori (or Kappabashi Street) has been around since the late Meiji period (1868-1912) but became a shopping street after World War II. 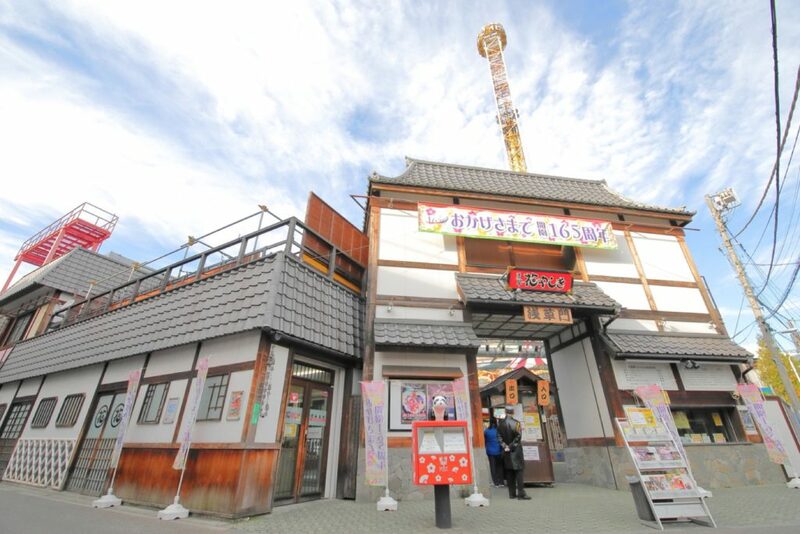 This famous strip is nicknamed “Kitchen Town” as it sells many tools used by restaurants and Japanese sweet makers. A must-see for anyone interested in Japanese cooking, you’ll find anything and everything you could possibly need for your kitchen at a cheap price here. A fun bonus is looking at all of the hyperreal plastic food replicas that Japanese restaurants use in their windows. See who’s handprint you can recognize along Stars’ Plaza. As Taito City’s equivalent to the Hollywood Walk of Fame, Star no Hiroba (Star Plaza) is a local spot to celebrate Japanese performers, artists and entertainers. 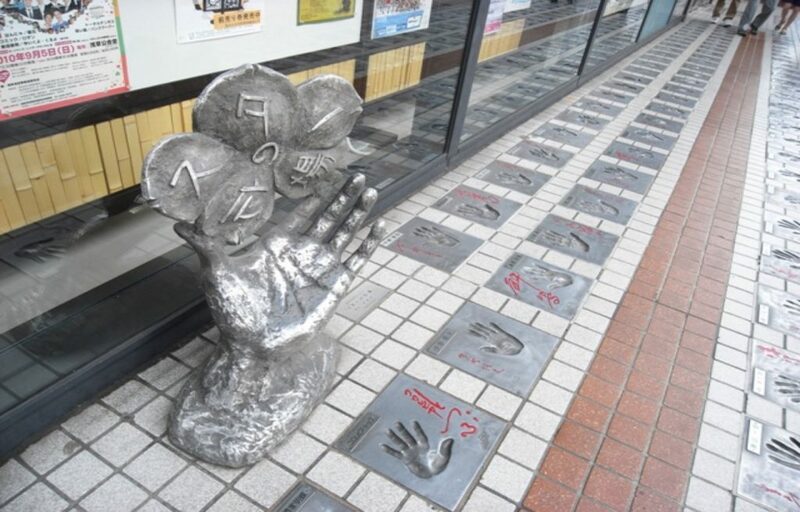 Here you’ll find life-sized hand prints of beloved actors, rakugo (comic storytellers) and singers. 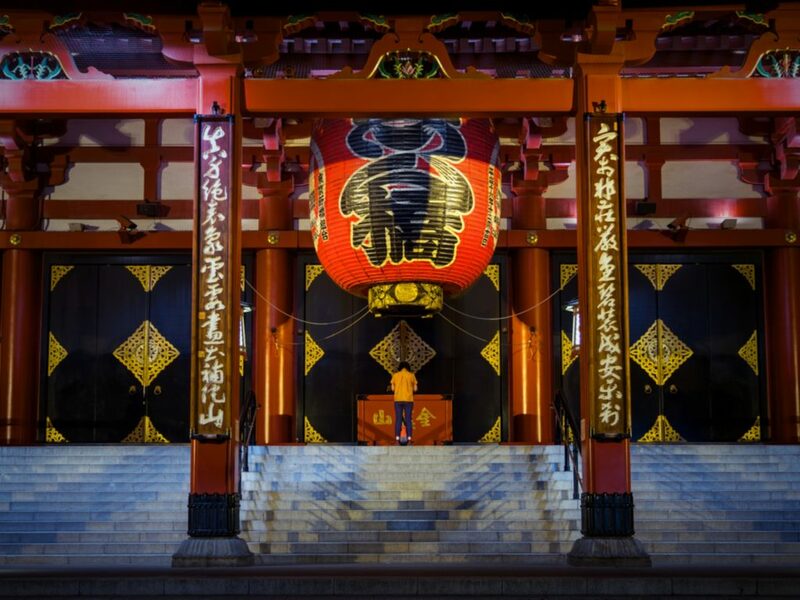 Star Plaza is nestled right in front of Asakusa Public Hall, and is the perfect place to go for those who love Japanese arts. 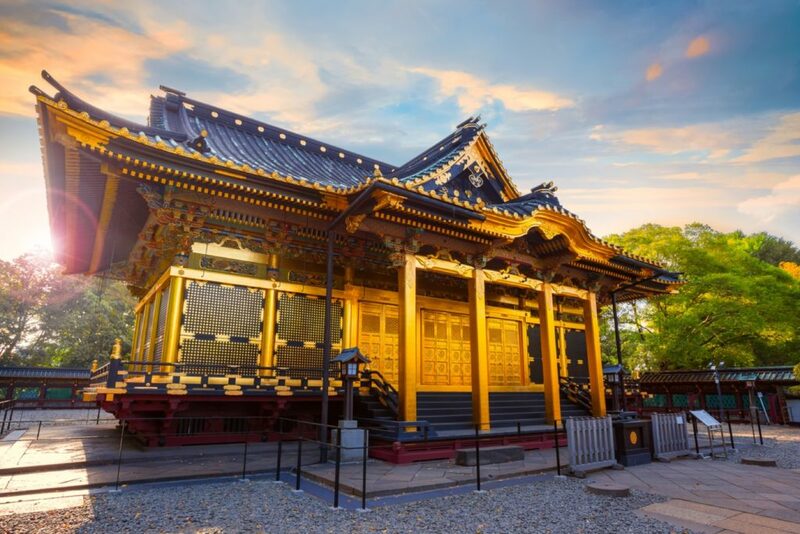 Ueno Toshogu Shrine is dedicated to the legendary Tokugawa Ieyasu, founder of the Edo Shogunate. Built in 1627 by the daimyo (lord) Takatora Todo, this Shinto shrine is known for its resilience having survived several devastating wars and earthquakes (which pretty much flattened everything around it) since it was built. As such, most visitors come to this shrine to pray for good fortune. A short walk from Ueno station, Ueno Toshogu Shrine and the Kaminarimon Gate are both a testament to the impressive building techniques of the period. 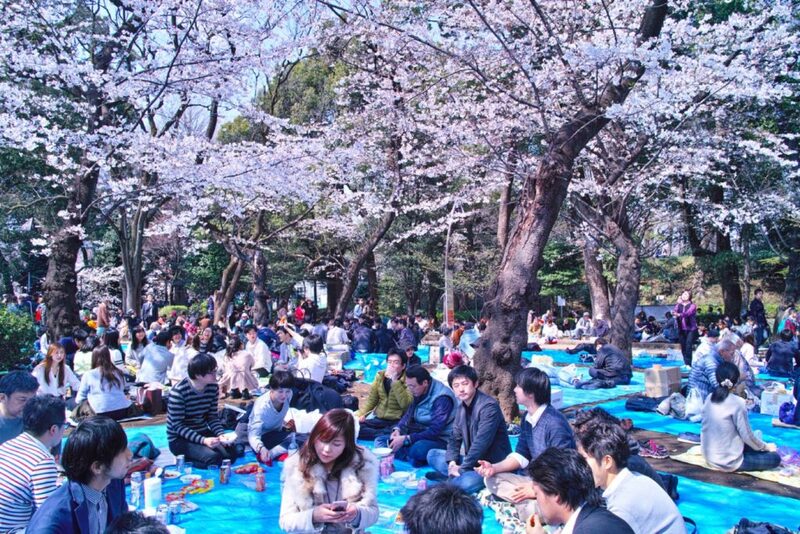 Ueno Park is one of the most popular places in Tokyo to do hanami (cherry blossom viewing). 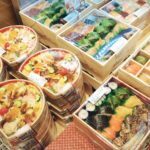 Bring bento (lunch boxes) and enjoy the friendly and bohemian atmosphere of Ueno Park, which was once the grounds of Kaneiji Temple, a family temple of the ruling Tokugawa Shogunate and one of Tokyo’s largest and wealthiest before it was destroyed during the Meiji Restoration in 1868. On weekends, this expansive space is filled with people picnicking, singing, dancing, and generally enjoying the outdoors. Surrounded by temples, shrines and some of the city’s best museums, it’s the perfect pitstop for a peaceful luncheon in the fresh air. 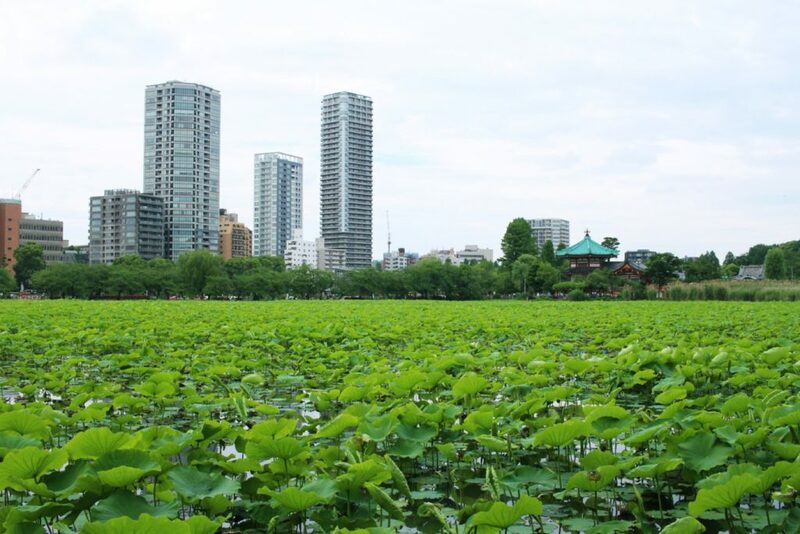 Shinobazu Pond is filled with water lilies in summer. At the southwestern end of Ueno Park, these gorgeous water lilies are depicted in famous ukiyo-e woodblock prints dating back to the Edo period (1603-1868). Shinobazu Pond was designed to emulate Lake Biwako, the largest freshwater lake in Japan, close to Kyoto (the country’s former capital). If you’re in Tokyo during mid-July, do not miss these flowers’ beautiful blooms. Spot the life-size blue whale at the National Museum of Nature and Science in Ueno Park. 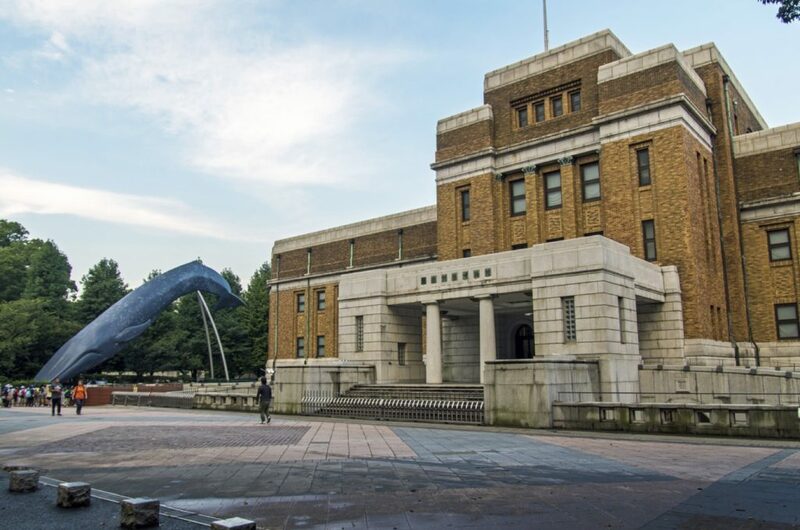 Established in 1877, the National Museum of Nature and Science is one of the oldest museums in Japan as well as one of its most important, being a key leader in the research and preservation of scientific specimens in Asia. Here you can learn about a wide range of topics including space exploration, technology, life, nature, and the history of the Japanese islands. Look for the enormous blue whale statue in front of the building. The haunted jizo actually looks pretty friendly. Traditionally, the Jizo Bodhisattva is the guardian of children, travelers and pilgrims whose statue is recognizable by its cute, often smiling face. 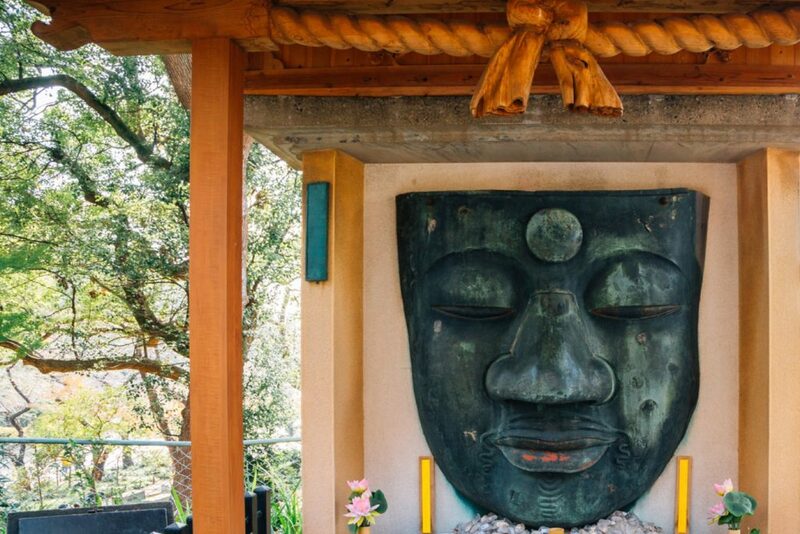 You usually find jizo at roadsides or along mountain hiking paths, as well as cemeteries. 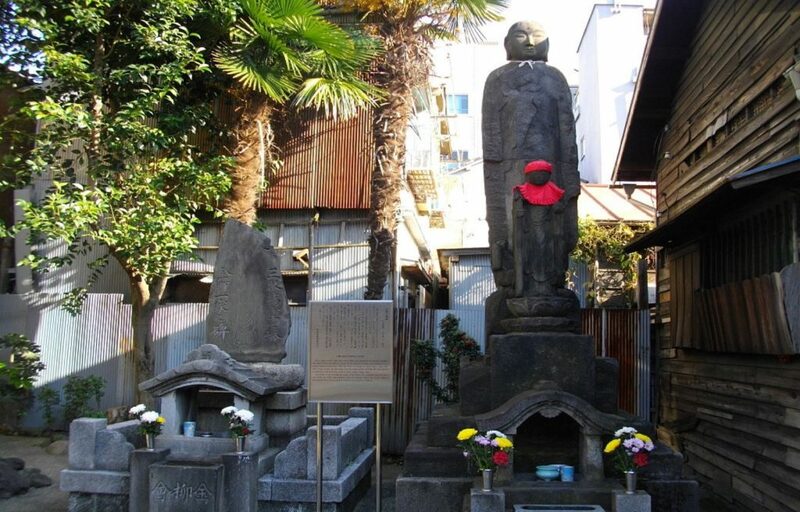 However, the “Obake (ghost) Jizo” constructed in 1721, is three meters tall and considered by locals to be haunted. Stories say that the statue’s head has been spotted turning by itself. Sumida River is 23.5 kilometers long and flows from the Arakawa river right through the city, and into Tokyo Bay. 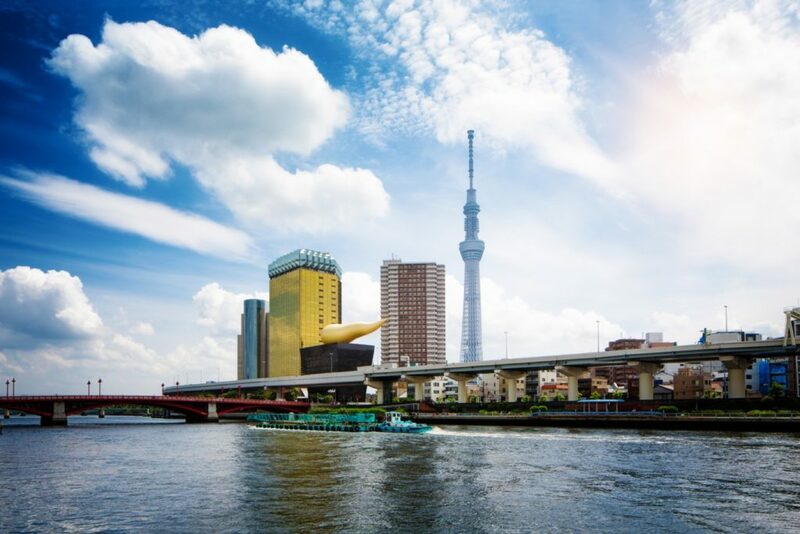 Take a stroll along the paved banks and watch the boats go by as the Tokyo Skytree soars high in the background. If you’re in Tokyo in the summer, the Sumidagawa Fireworks on the last Saturday of July are some of the city’s most spectacular — watching them from the riverbanks in a yukata is about as local as you can get. 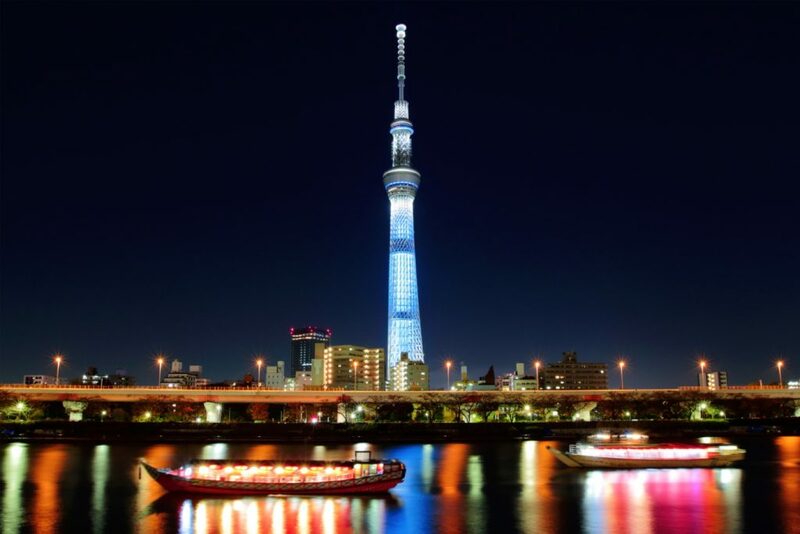 Yakatabune cruise the Sumida River at night offering epic views, and sometimes karaoke. The practice of having dinner on a yakatabune (house boat) was popularized in the late Edo period, and continues strongly today. An evening drifting on the dark water in a lantern-lit wooden boat, dining on traditional food as the city twinkles in front of you is a magical old-meets-new experience. You can either book an entire boat, or just a table to enjoy with your friends. Yakatabune depart from Asakusabashi, Yanagibashi, Tsukishima and Hamamatsucho, and travel along Sumida River. The enormous Tokyo National Museum is the oldest and largest museum in Japan. 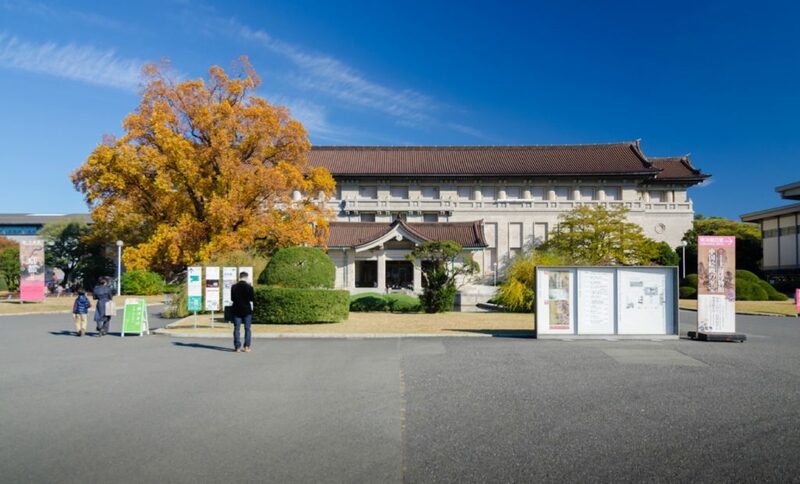 Established in 1872, Tokyo National Museum can officially claim to be Japan’s oldest museum while also being one of the largest art museums in the world. It’s well-known for its enormous collection of artwork and archeological artifacts, which have been gathered from Japan and across Asia. The Japanese-style garden and teahouse is a lovely addition to a few (or more) hours exploring the over 100,000 items on display. Pray for some financial assistance at the small but picturesque Gokoku-in Temple. Founded in 1624, Gokoku-in Temple is located near the Tokyo National Museum and enshrines Daikoku-ten, a god of happiness and wealth. There are around 1200 sakura (cherry blossom) trees planted in Ueno Park but Gokoku-in Temple, almost shrouded in a grove of them, is a famously beautiful place to do cherry blossom viewing. Picture how big this Buddha must have been in its original form. Located in Ueno Park is a hill called Daibutsu Yama (Great Buddha Mountain). In 1631, a statue of a seated Buddha was donated to this site. However, the statue was destroyed in the earthquake of 1647 and its replacement then destroyed by the Great Kanto Earthquake of 1923. Nowadays, you can only see the Great Buddha’s face and the 1972 stone pagoda built to house it — but it’s worth visiting for the fantastic history that lies beneath it. The charming Showa-style entrance to Asakusa Hanayashiki. 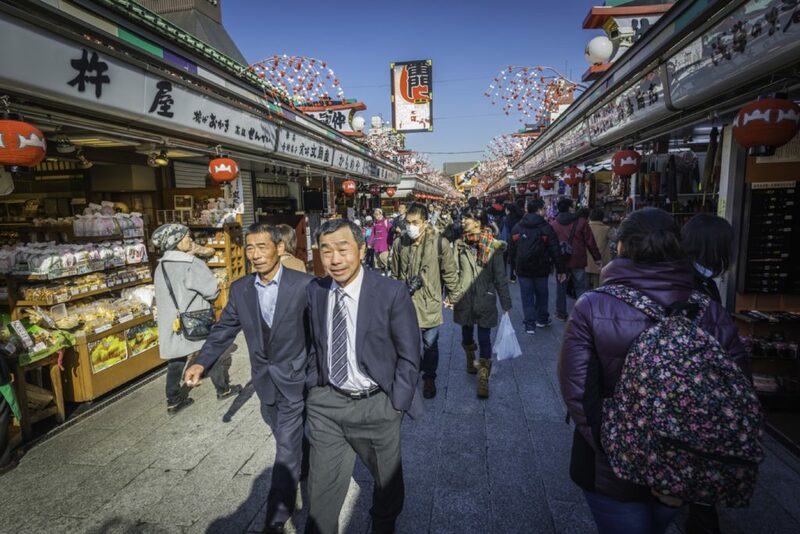 Asakusa Hanayashiki is Japan’s oldest amusement park and a charmingly retro slice of Tokyo. Opened in 1853, during the Edo period, the park has grown and changed with the passage of time, and was developed into a modern amusement park after World War II. Squished in between Sensoji Temple, apartment buildings and office towers, it’s definitely a surreal experience to be riding a somewhat rickety 50s roller coaster with the view of the Tokyo Skytree in the near distance. Yanaka Ginza shotengai (shopping street) with the sake store on the left. Apart from cats (see no.6), Yanaka Ginza shopping street in Yanaka is filled with small mom-and-pop shops that have been around for generations. The street has an old-fashioned atmosphere, lined with about 70 shops selling okazu (Japanese side dishes), fish, meat, vegetables, fruit, flowers, stationery, bento (lunch boxes), tea, books, medicine and shoes. The liquor store at the end has a small outdoor bench from where you can sip amazake (sweet, hot sake) and watch the shoppers go by. 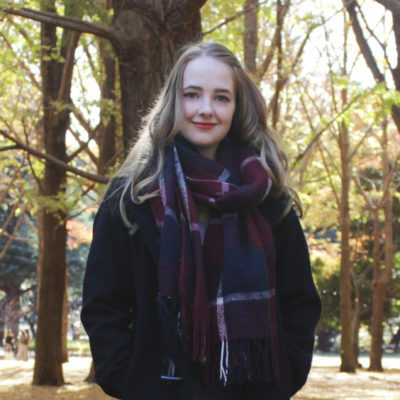 Tokyo-based writer, video-maker and aspiring dog owner. 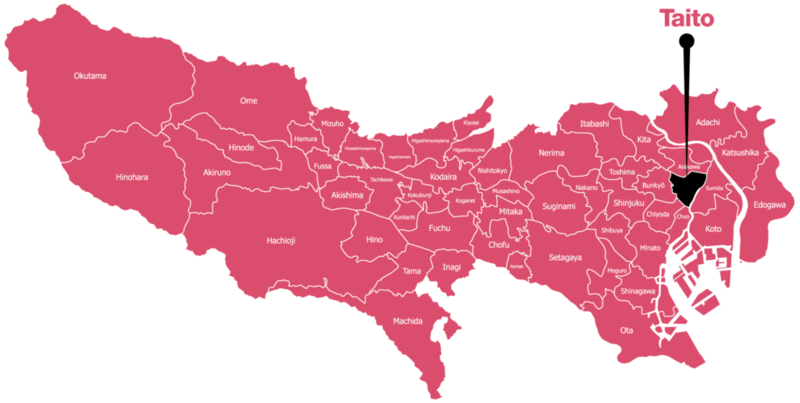 Advice from a local expert on how to get the most out of Japan's No. 1 scenic art destination.